It’s a commonly held view that the only bits of financial reports worth paying attention to are the numbers at the back – in the profit loss account and balance sheet for example. For investors alive to potential shenanigans, the audited numbers get us close to the unalloyed truth about how a company has performed. The executives’ words at the front of the report are perceived as little more than marketing spiel. But, as long as we’re suitably resistant to hyperbole, the words can tell us something about the kind of company we’re dealing with, and whether we might like to invest in it. Since SharePad includes access to company news and reports, it contains a trove of words as well as numbers. It also has tools to interrogate them. If you have a portfolio or watch list in SharePad you’ll probably be interested in news about the shares in it, or some of the news at least. The news tab shows you all the news for the shares you are following when you click on “current list”. Big portfolios full of newsy companies, produce long and unruly list of news stories, which are particularly unforgiving if you page forwards and backward directly between news items using the “Newer story” and “Older Story” links. I tame this list by filtering it so I’m not unceremoniously dumped in pages of useless news. Since I’m seeking to exclude whole categories of news, I use common phrases found in the headlines, rather than searching the full-text of news items. The news I’ve chosen to lose is mostly routine items companies are obliged to report. I still get news I’m interested in, like company results, notifications of board changes, news about acquisitions, and directors’ dealings. Used this way, filtering is a time saver but I’m interested to see whether it can help us ditch bad investments and discover good investments too? Traders filter news to quickly identify profit warnings, announcements indicating a company will earn less money than expected when it next reports, and earnings disappointments – when a firm reports poorer results than expected. They routinely check the news feed from 7am, when publishing starts, hoping to identify bad news quickly and sell shares in stricken companies before other traders react. 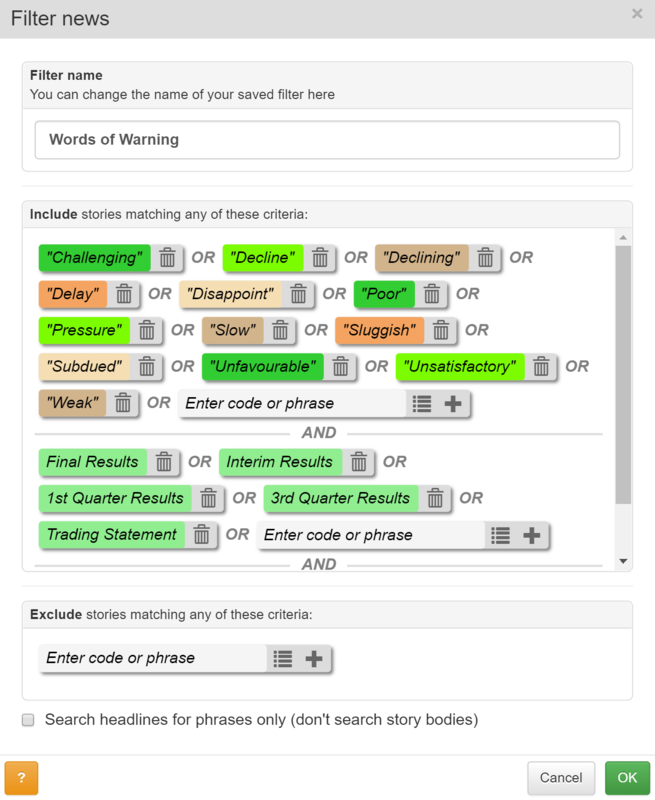 Since time is critical they filter their news feeds for words suggesting a deterioration in performance, such as those in the SharePad filter I’ve built below. Some of the lists I’ve seen are much longer, built up over months or years of reading bad news, but I hope you get the picture. You need to avoid words that routinely appear in the financial statements, like “loss”, which is part of the phrase “profit and loss”, and would return every company’s results irrespective of how they’ve performed. The most recent set of full year results brought back by my simple warning filter belongs to sofa retailer DFS. SharePad highlights each occurrence of a word or phrase so I can easily see DFS’s results use “challenging” seven times to describe the state of the UK furniture market, often preceding the word with “very”. It uses the word “weak” twice to describe sterling, which has increased costs, and once to report an unexpectedly severe weakening of demand. It also reports a “decline” in year on year order intake, a “slow” down in trading, and cost “pressures”. In fact, reading DFS’ statement, I think you could mine a few more warning words and phrases. Does it work? Apart from being a great way to speed read using the highlighted terms, the significance of these words will depend on what kind of investor or trader you are. Traders seeking to capitalise on momentum, the tendency of prices to keep moving in the same direction, at least for a short while, will sell bad news and buy good news. Many contrarian investors take the view that bad news creates opportunities. Traders, they say, overreact, sending share prices plunging down below fair value. Those investors with sufficient conviction to buy and hold the shares until firms recover should prosper over the long-term. Contrarians will take heart from an intriguing experiment conducted by Bruce Packard, an analyst, independent consultant and blogger who gathered fifty statements from 2012 and used algorithms to analyse the text. It was a small sample, and the experiment was not a complete success, but Packard found negative words like those in my filter were associated with high returns over the subsequent five years. It wouldn’t surprise me if there were computer scientists in the backroom of some hedge fund or investment bank putting this kind of textual analysis to work, albeit probably aimed at larger companies over shorter timescales. Although I think of myself as a contrarian investor, I don’t seek out bad news. My style of contrarianism makes me somewhat indifferent. I don’t follow the market, like a trader might, or buck it, like the other kind of contrarian. I prefer to focus on the enduring qualities of businesses that mean they should prosper over the long term, irrespective of recent news and what it means to other traders and investors. I believe the best long-term investments are firms building and improving unique capabilities. In business school jargon these capabilities are known as competitive advantages. They enable companies to invent special products and services they can earn more money from. Evidence of competitive advantages can be found in the financial statements. Firms with advantages should be highly profitable. Profit margins, the difference between the value of sales and the cost of production should be large compared to other firms. They should earn high levels of return on capital, which is profit compared to the money invested to earn the profit. While the numbers can tell us a company may have competitive advantages, they can’t tell us what the advantages are, or whether they are likely to last. Sometimes products are fads, and earn outsized profits for a few years, and sometimes advantages are easily copied by competitors. Advantages that last usually stem from a company’s culture. Firms that empower and reward staff so they really know and serve their customers develop reputations, brands, relationships, specialist expertise and many other intangible advantages that encourage customers to return time and time again. The uniqueness of competitive advantages makes searching for them a daunting prospect, though. My first attempt is to search for companies that talk the business school language, i.e. to search for the phrase “competitive advantage” and others associated with it. I wouldn’t expect this filter to produce a comprehensive list. Companies often concentrate on short-term performance in their reporting, and even if they do articulate underlying business strengths, they may not use the same jargon. I’d also expect the list to contain false positives, after all it’s not unheard of for executives to talk the business school talk without walking the walk. Phrases like “long-term” are used in many contexts, some of them irrelevant. The filter needs some work, but it digs up some interesting prospects: Cohort, Electrocomponents, Oxford Instruments, Scapa and Smiths are all talking my language. 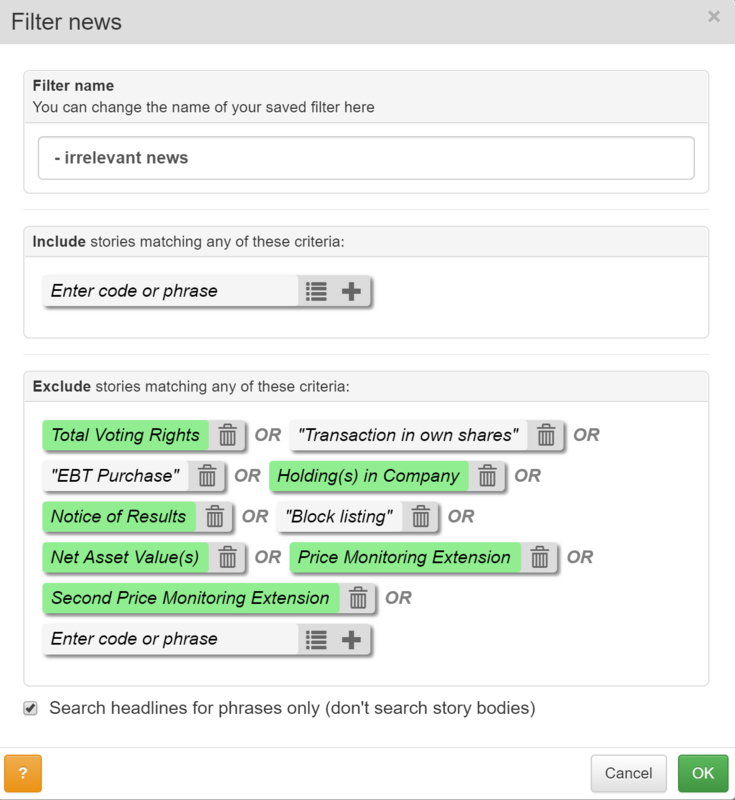 To create news filters in SharePad, click on the Filter button in the News view. Click on the orange ?button at the bottom of the News view for help. Alternatively, call the customer support team on 020 7749 8555. 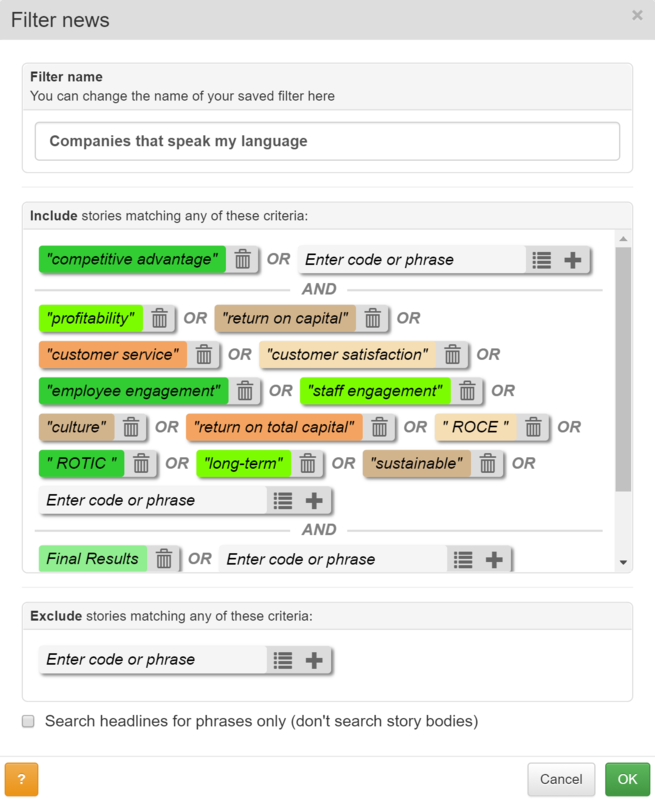 To create news filters in ShareScope, right-click in a News view and select Set news filter. Call customer support on 020 7749 8504 for help.